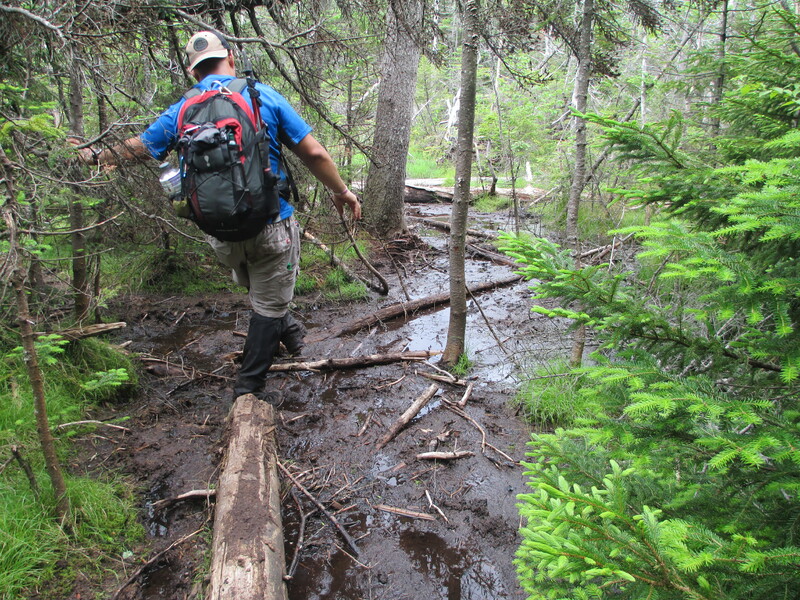 It’s been a slow start to my hiking season this year, in light of the driving rain and t-storms in the forecast for most of the summer to date. I was in need of a hike that would give my self esteem a bit of a boost and remind me that my 46er goal was indeed within my reach. 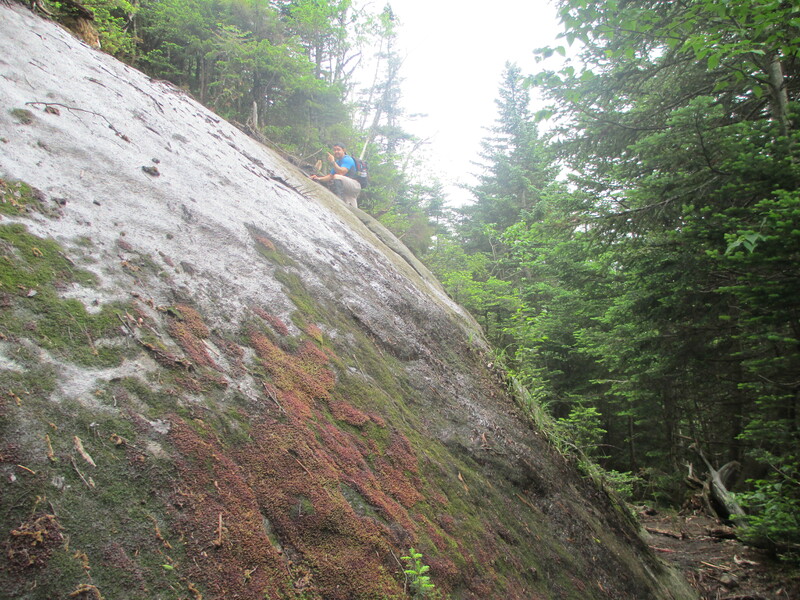 Mission accomplished with a successful loop of the Santanoni range! I’d been fretting a bit over this hike from the beginning due to the length of the hike (18+ miles), rumored difficulties in following the herd paths and general remoteness. 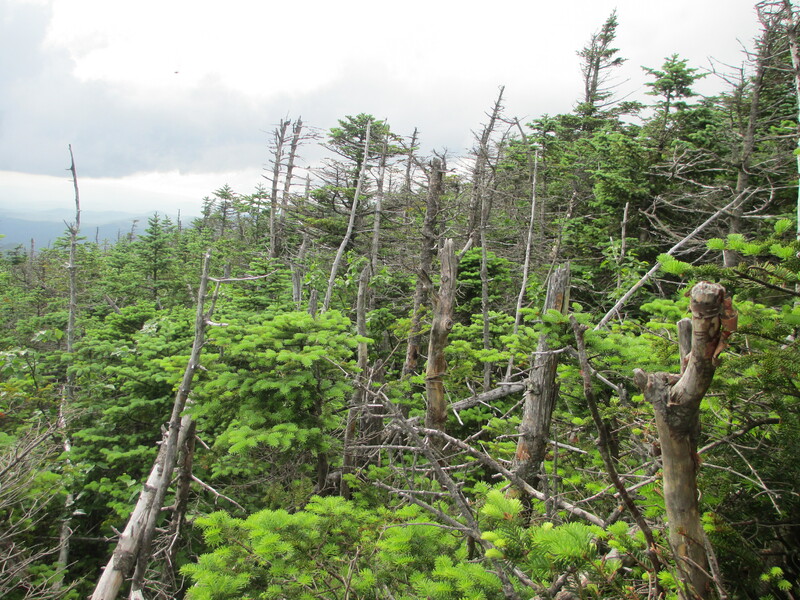 In reading trip reports and talking to other hikers it seemed the general consensus was that this was no one’s favorite high peaks hike, but rather one that most were happy to put behind them. 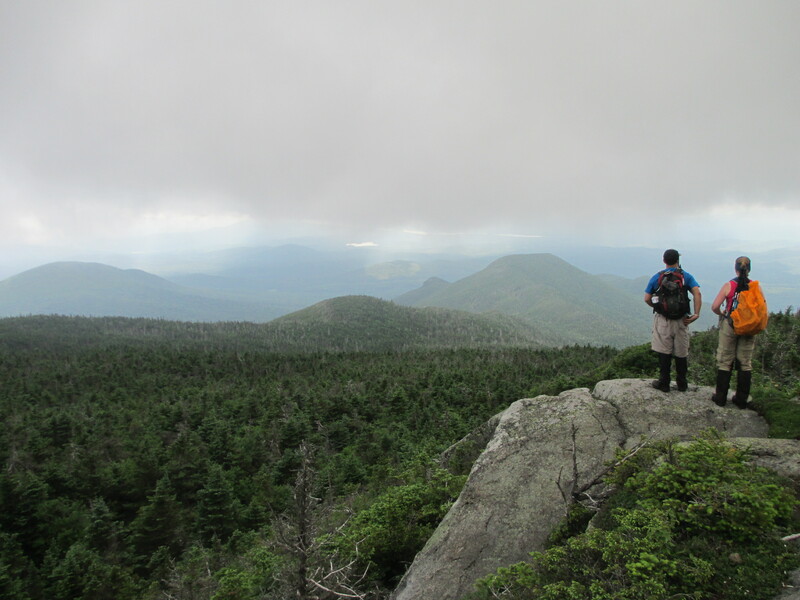 I put a call out on the high peaks forum for hiking partners and was thrilled to hear from one very seasoned hiker who not only was familiar with the Santas but also really enjoyed the range. A couple of other forum members expressed an interest in joining, so our foursome met yesterday at 5:30 am. 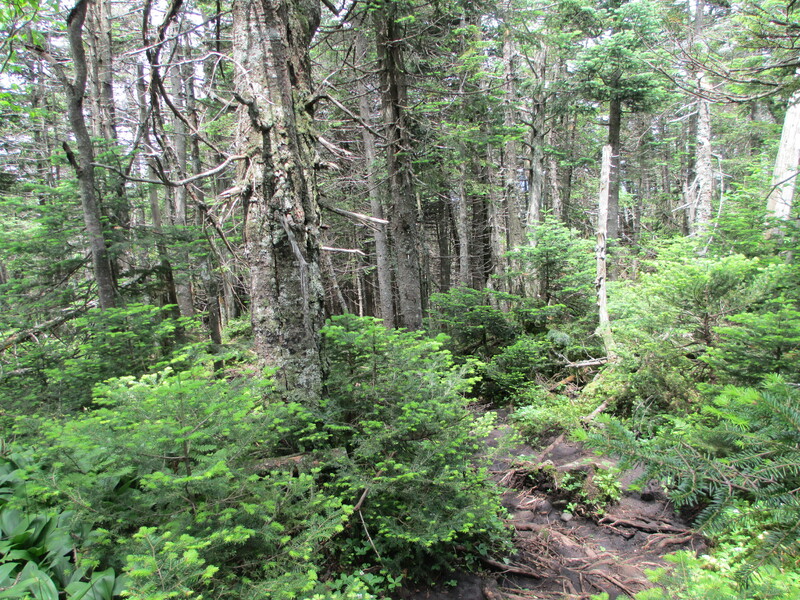 By 6, we were hiking out of the trailhead toward the Santa express trail to began our ascent. I struggled almost from the very beginning, feeling like it wasn’t my day. I’ve been training regularly at the gym, but am still not in top form and struggling with the ascents – something I really didn’t have a hard time with last year. 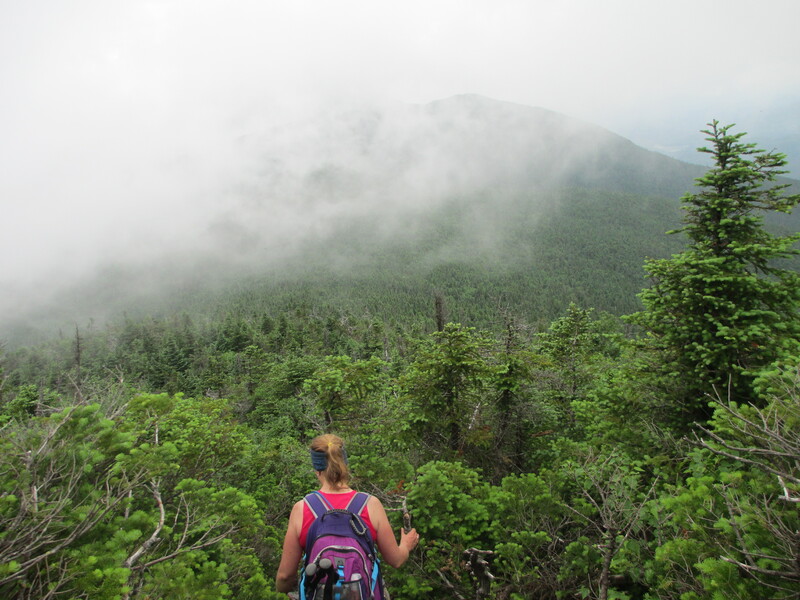 It was also incredibly humid, even at the higher elevations. There were several times throughout the day where I questioned whether I could do it, and my pace was slow. But I had a great, supportive group and pushed myself up the steep express trail. As we neared the peak I could imagine the views from the ridge were amazing, but as per the usual there was rain in the forecast and clouds were blowing in and out. 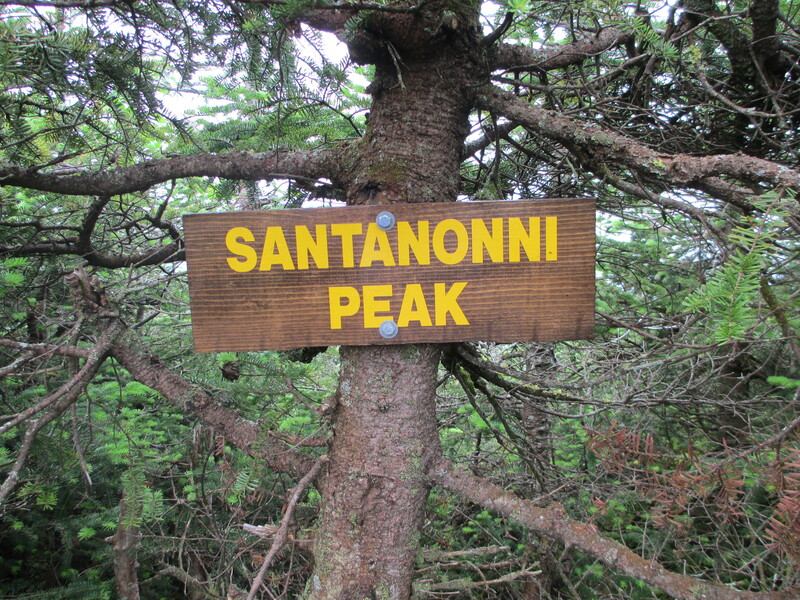 Reaching the summit of Santanoni really lifted my spirits. We had a snack, took some pictures, and headed off for Times Square, the intersection where we’d find the herd path leading to Couchie. 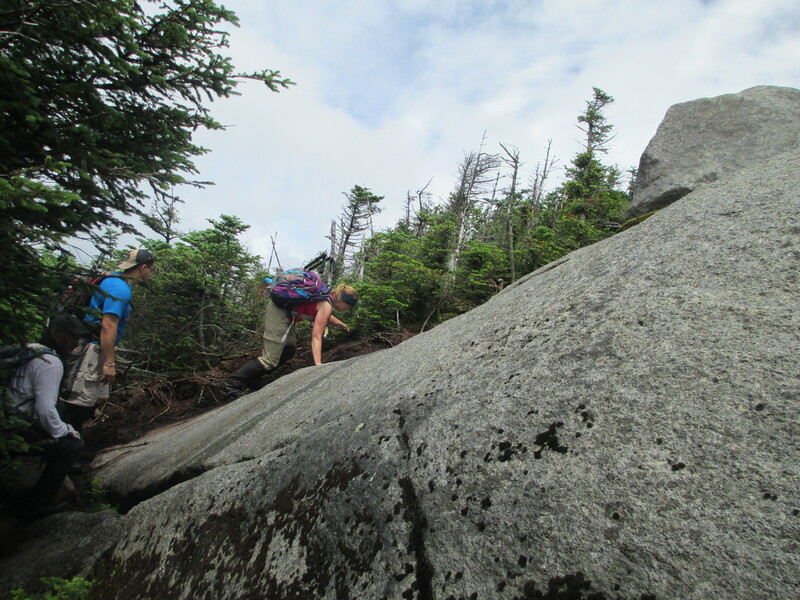 I really enjoyed the loop hike itself and didn’t find the paths or rock scrambles particularly challenging. The toughest part of my day, both mentally and physically, was hiking to and from Couch. Having to lose and regain elevation when you are already tired is incredibly frustrating. 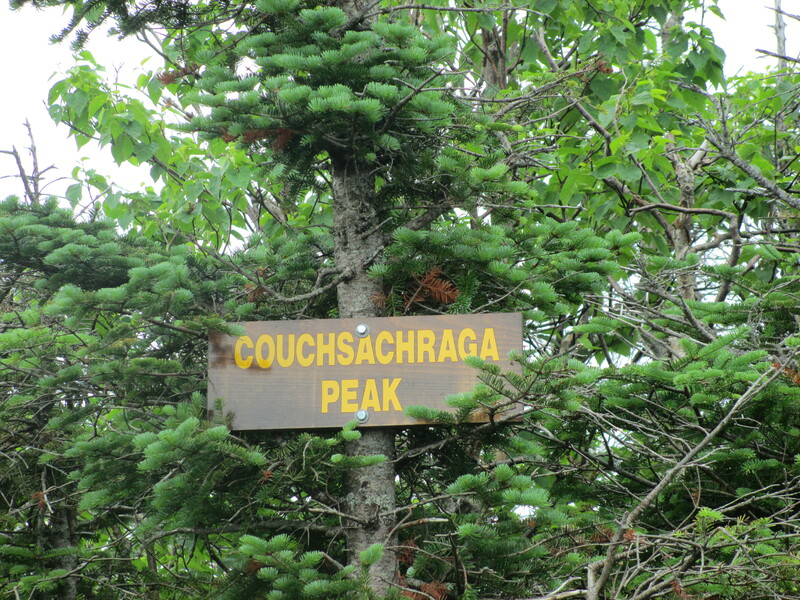 If there was one peak I wanted to summit yesterday it was Couchie, and I kept willing myself to push on so that I didn’t have to return for it later. It took us about 1 hour and 45 minutes to reach the summit, and about the same amount of time to get back to Times Square. With Santa and Couchie behind us, the walk to Panther was a treat. Just a skip away from Times Square was Harold Square, and the cairn marking the start of the Panther herd path. 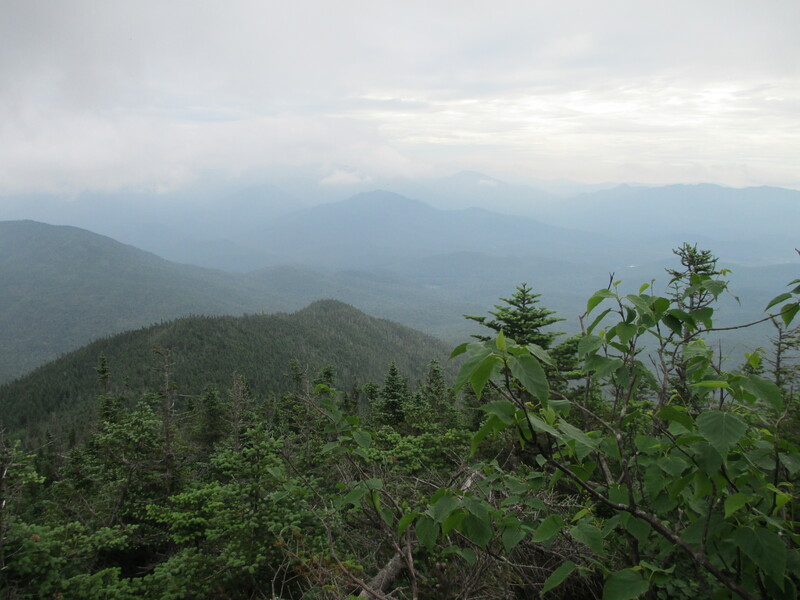 It only took about 15 minutes to reach the summit, and the rock scrambles and expansive views from the open ridges were fun and beautiful. Another short break and a few pictures later and back down we went to Harold, where we picked up the Bradley Pond herd path for the final descent back to the trailhead. We began the return trip at around 5:15 or 5:30, quite late in the day. In the back of my mind I knew that meant we’d be walking out in the dark, but I tried not to think about it. The hike out was long, and my energy was depleted. At one point my hiking partner was kind enough to give me some 5 hour energy, which seemed to almost propel me forward for the rest of the hike. It will now be a staple in my first aid kit. 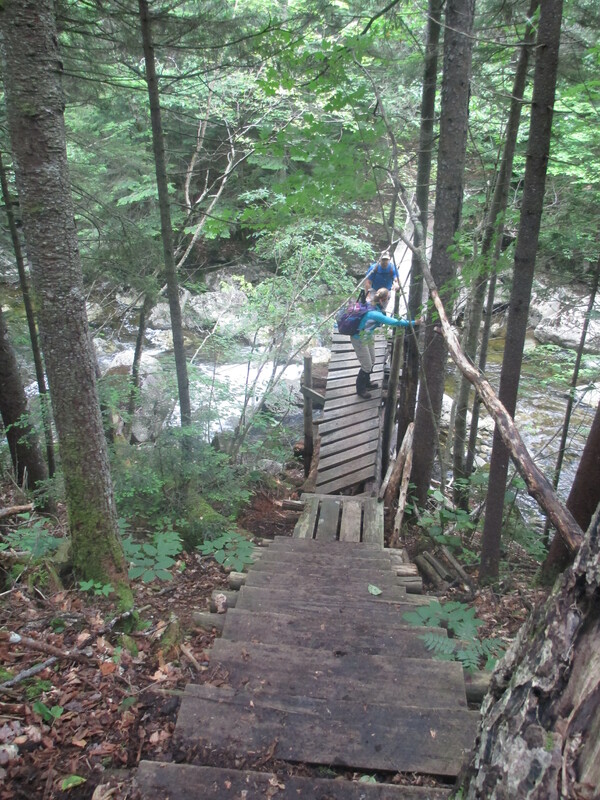 When were were almost all the way down, I slipped on the wet, slippery steps of a rickety “bridge” and pulled some muscles in my arm and shoulder, but luckily I was fine. As exhausted as we all were, we kept a great pace and managed to get all the way to the gravel road, the last leg of our trip, before darkness descended. 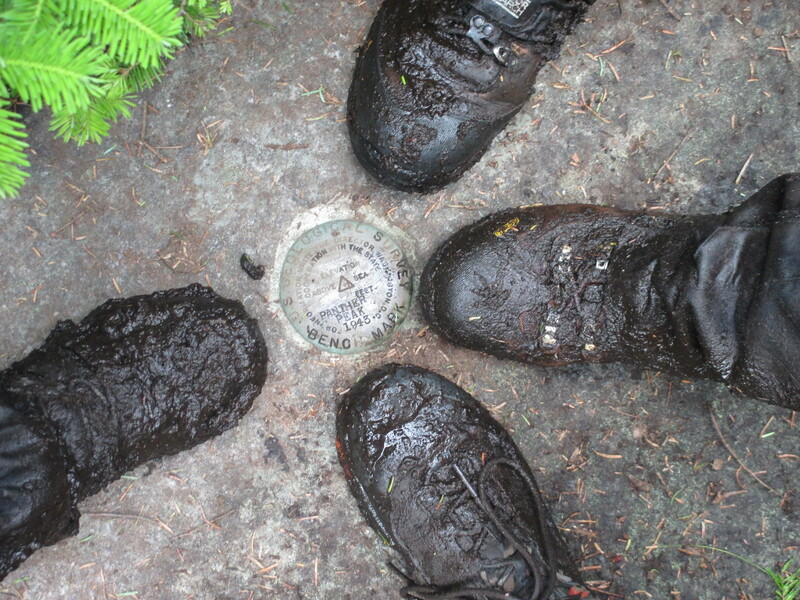 We reached the trailhead at 9:30 pm, 15.5 hours from when we began. It was a long day, but I really did enjoy it. 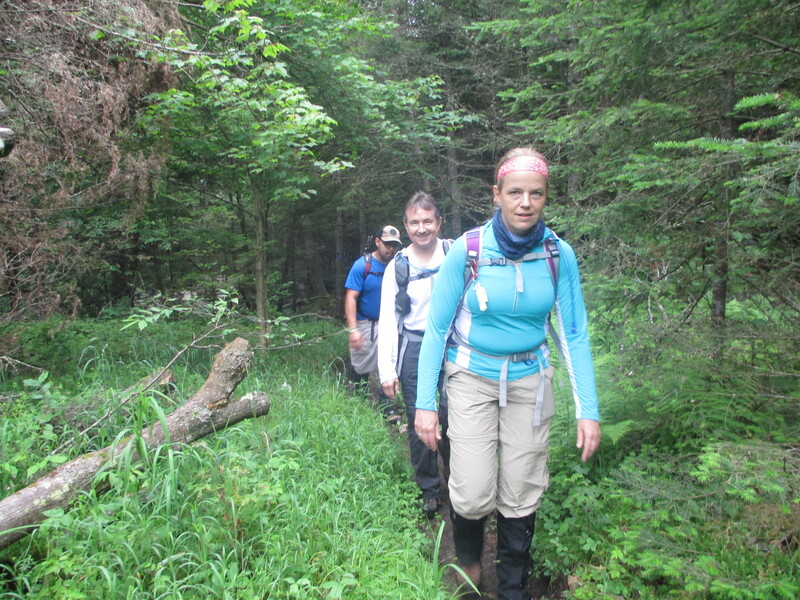 I feel lucky for the opportunity to share this hike with such upbeat and kind-hearted folks. 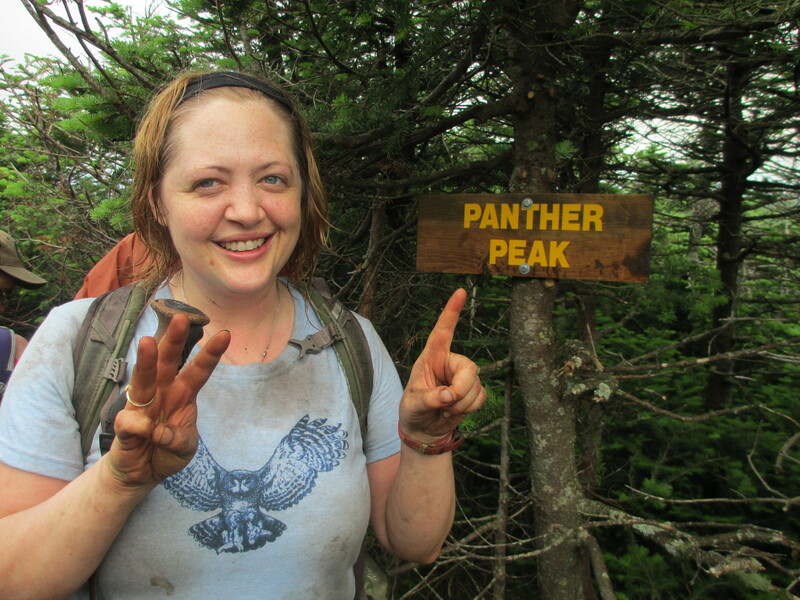 And I am beyond thrilled to have hiked all three mountains in the Santa range on the first attempt. I am feeling very optimistic about the rest of my hikes this year, and look forward to getting back out there later this week. 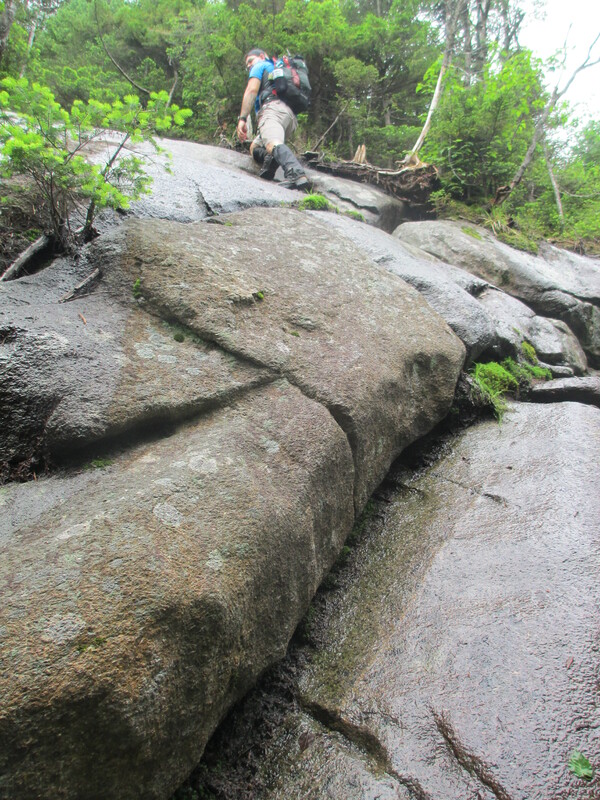 Ascending the express trail. There’s a wooded path around this challenge, which I opted to take. 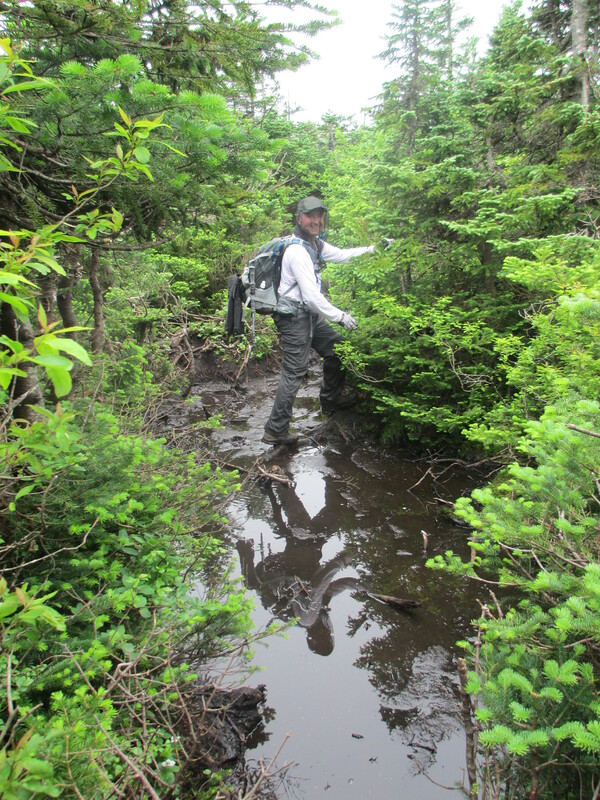 The first of many bogs we encountered. 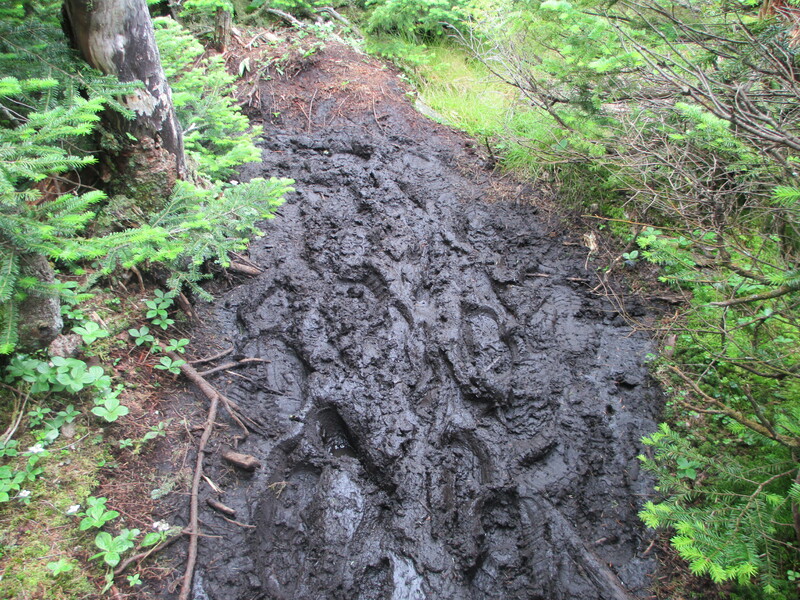 Mud: a reoccurring theme of this hike. Never been so happy to complete a range! Wow! That’s great you did all 3 ! I was really wishing I was in shape to join you, but I had as tough a time on Big Slide, and also no summit view. But sun again on the way down. Great going! Pru, So great that you posted a pic of yourself, its so good to see you! This hike looked like fun since you had three others with you. It was a mighty long hike. Your pics are always awesome to look at. Hope your arm and finger heal fast. Looking forward to your next hike. Way to go #31 woohoo!!!! Ha, thanks Suzanne! 🙂 I hate posting pics of myself as you no doubt have figured out… but I was so happy to finish this range and I thought it showed in that photo! I’m totally fine – sore muscles but that’s par for the course. So great to have gotten over 30! I’m happy that you were able to get all 3 in one day. Looks like there was alot more mud than when Jenn and I were in the Santas! Thanks, Susan – me too! Definitely a mudfest but we were definitely expecting that, with all the rain we’ve had. Congrats, Pru- more than two thirds there!! Sitting here in the Loj great room & thinking about Couchie- ugh, I’d rather not! Tomorrow we’ll hike Cascade & maybe Porter- quite a reasonable step up from Jo this pm which was delightful. Glad your injury was to your arm & not to your leg! I fell once doing my 46-in the stream coming down off Allen. Keep it up- every outing is one ( or 2 or more) steps closer! What’s next? Karen, you are in town now? I’m heading up to Keene tomorrow – am off from work this week. Let me know if you have any time to hike, or at least meet and say hi! Enjoy your eve at the Loj! Wonderful photos to commemorate a terrific accomplishment. That’s a very long day on any trail let alone one with three peaks tossed in for a challenge. Congratulations! Nice job! 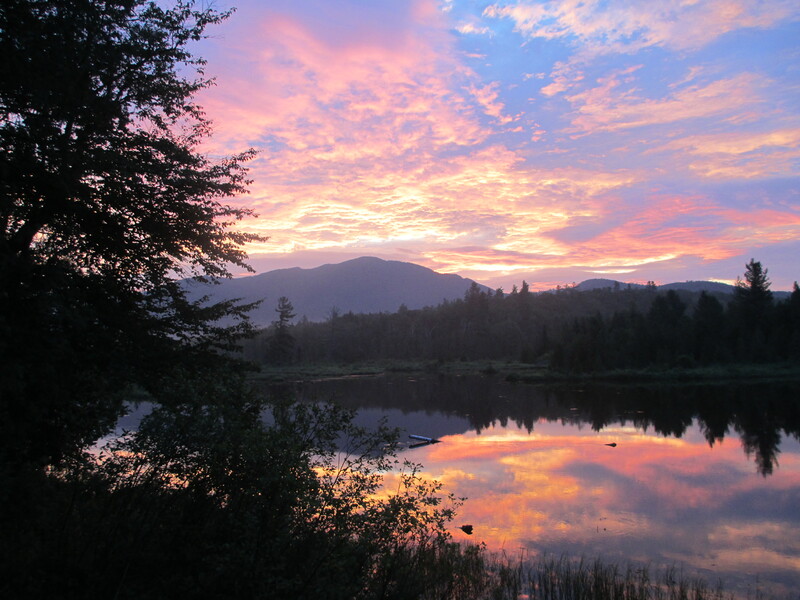 I took two days and camped at the pond below the main herd path. Couchie looks so far away from Panther! Pru, I’m so sorry to have missed you- Internet at Loj did not reach our room and received no email notifying me of your response. Home now but Donald & I hiked Cascade & Porter yesterday. He’s now a “2’er”! Yay for Donald! I’m glad he is enjoying the Adirondacks with you. And no worries – we’ll catch up next time. P.s. met a woman on our way down from Porter who needs only Marshall & Allen to finish. She mentioned that she was reluctant to tackle Allen alone. I have her contact info if you are interested in contacting her. It was great hiking with you Pru! I’m really proud of how you pushed through. Hope to hike with you again. Thanks, Chuck! I had a great time hiking with you too. Hope to get another one in before you move to AZ! The view from that peak is stellar. You’ve gotta love those compromised skies. Looks like it was a perfect day for hiking. Yes, sorry I can’t regale you with tales of how much I loved Couch. 😉 I found it a bit demoralizing, but it was sweet to get back to Times Square with it behind me. 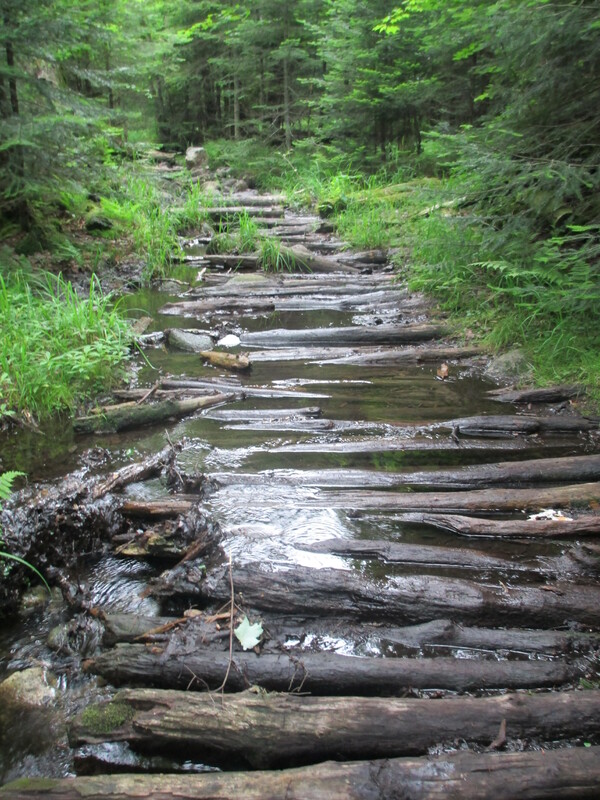 The hike itself to Couch was pretty though, and I even thought walking through the bogs was kind of fun. Thanks, regarding the photo!